Abandoned by her father during the Depression, eleven-year-old Elsie lives in the garage behind her old house with her mother, grandmother Nan and out-of-work uncle. Elsie's friend Scoop accompanies her as she searches for her father in the city, encountering unfriendly hobos, food lines and shantytowns. After both her uncle and her mother disappear on mysterious errands, Elsie and Scoop eventually discover them competing in a dance marathon. Persuading them to abandon the contest, Elsie and Scoop lead the exhausted dancers home, where Nan has news of Elsie's father and his impending return to the family. 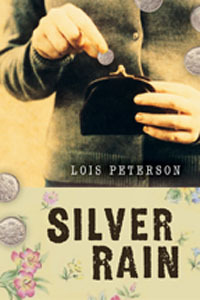 "Young readers will be right there alongside Elsie as Peterson's spare, fast-paced prose portrays her character and experience with intimacy and warmth...In Peterson's finely wrought, affecting children's fiction, the characters are created with tender consideration for human complexity and frailty, for there is always more to people and why they do what they do." "Elsie's situation is well written enough to give you heartache...The historical points are well research[ed] and the exploitive dance marathons found during the depression are highlighted, which is an interesting and lesser known situation to learn about. A solid book." "This story of a family suffering through economic hardship will resonate with many of today's readers…Despite the grim plot elements, this is a story of hope, and it is smoothly written…Well-researched historical fiction with a sympathetic main character." "This is a story of hope during adversity and the danger of secrets...This accessible story will be received well by younger readers interested in historical function. Recommended." "Peterson's characters are interesting. They each have their eccentricities and funny foibles and seem very realistic...This book could lead to excellent class discussions [and]...deserves to be read and discussed as part of Canadian studies on the Depression." "Accurate and eye-opening to students who may be unfamiliar with the hardships many endured during the Depression...Elsie and Scoop are both likable characters...This book would be a nice companion piece to use during a unit on the Depression." "Terse, grim, and funny, the plainspoken narrative from Elsie's viewpoint beautifully conveys a child's sense of the times...The surprises are never melodramatic, even as they build to an ending that reveals what despair can force the desperate to do." "Silver Rain is They Shoot Horses, Don't They? for the tween set and it must be read…After you pick your jaw up from the floor, however, you'll find that this story feels wholly and respectfully authentic to its time period…Peterson gets the little, evocative details just right." "The novel's younger characters are authentic, and the readers will have no trouble seeing the world through Elsie's 11-year-old eyes. Similarly, Ernest "Scoop" Styles, Elsie's charming and curiosity-driven friend, is ably crafted...Well selected periodical details give the book shape and depth." "The search for family and relationships in tough times rings true…An absorbing and perceptive story." "Themes of bleak hopelessness, destitution, and helplessness permeate this gritty, true-to-life story of the 'Dirty Thirties.' It would be a solid addition to libraries…Recommended."